Recently, I added a Sig Sauer P365 to my handgun collection. Compared to other slim designs, it’s a pretty amazing gun and a solid option for concealed carry. 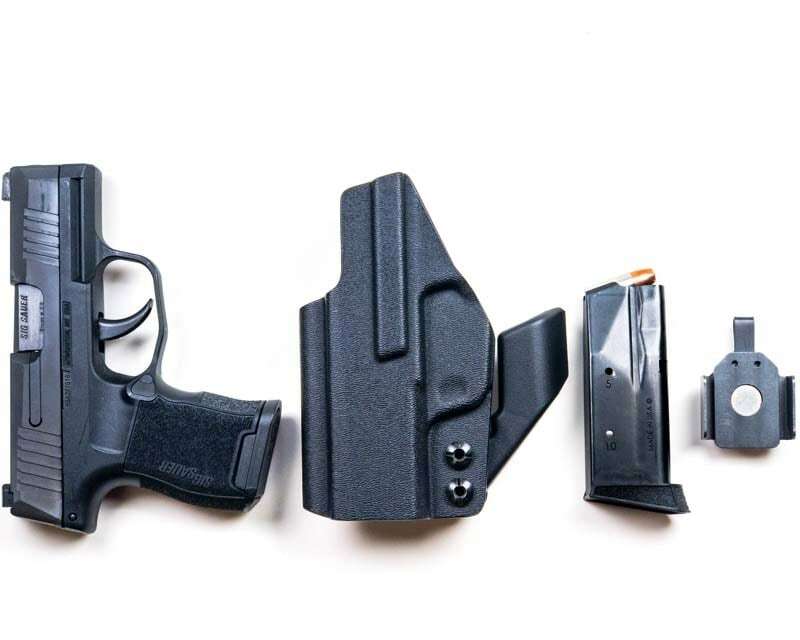 So, the next logical step is exploring new holster options – a task that’s often overlooked with new handguns. Here are five solid options for the Sig P365. Given that the P365 is the first handgun I consistently carried in the appendix position, the ANR holster preformed wonderfully. Of the two holsters I used in the appendix position, this was probably the most comfortable due to the larger belt clip and the shape of the polymer claw. This is a quick-ship item from HazMat, which means that it arrives in two-to-three days in most cases. It’s nice if you’re in a hurry and don’t want to wait. But, to be fair, this holster is nearly identical to the ANR, but the big difference is the belt clip width and the claw shape. They both work very well, but the ANR was just a tad more comfortable. 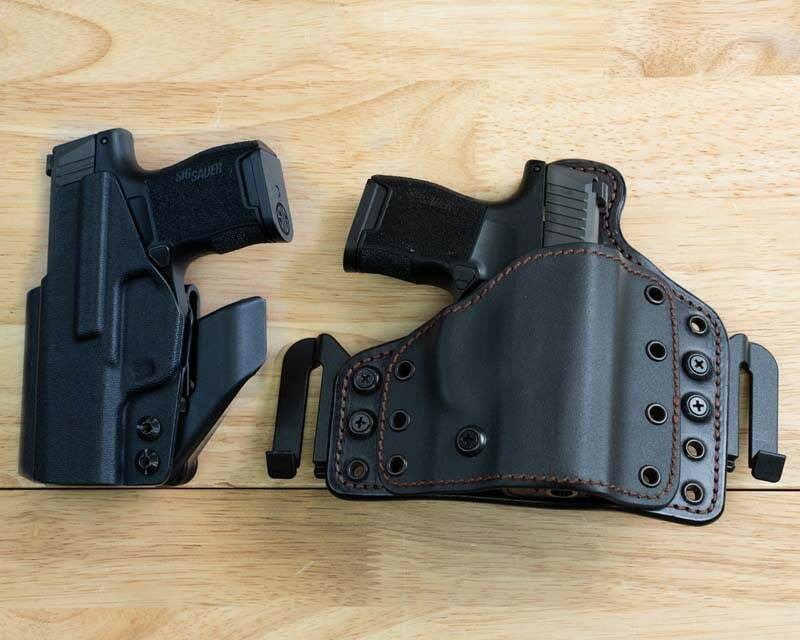 These pocket holsters are a must with any smaller-sized handgun. Whether or not you end up using it as a holster, it’s great for transportation. I carried the P365 in my bag. However, I’m looking forward to using it with shorts when warmer weather comes along. 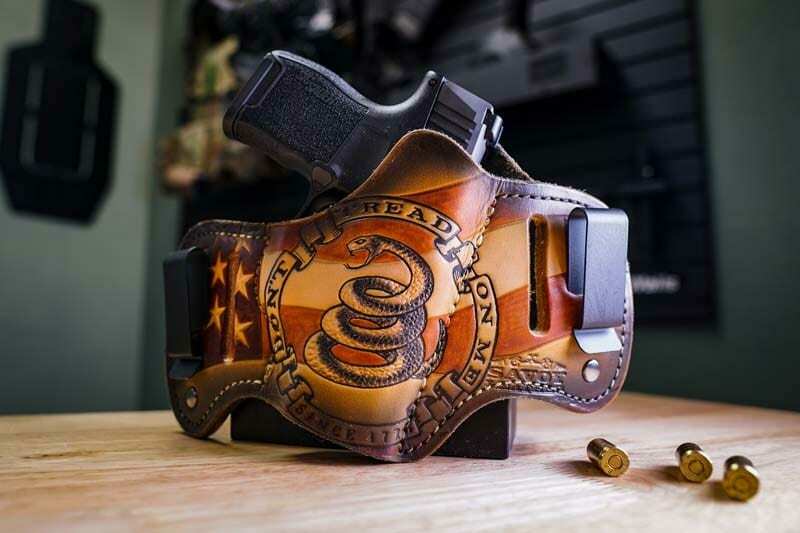 The DTOM 1776 Patriot holster offers both function and looks. While it works well both inside and outside the waistband, it would truly be a shame to use this as an inside the waist band holster. Frankly, it’s a work of art. Jeremiah Savoy obviously puts a lot of thought and quality into his work. However, the sturdy design was the most difficult holster to take on and off, so don’t expect to just grab it and go. Yet, once it’s on, it’s on. And this quality comes at a higher price. The RELIC Hybrid was the most unique of all the holsters I tried. 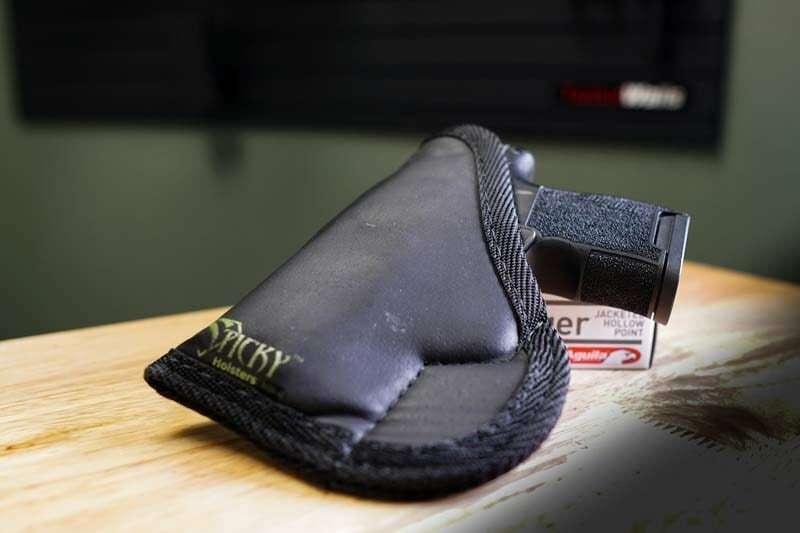 It’s a kydex shell with a leather interior, so it has the rigidness of kydex but with the feel of leather – so less wear on the pistol’s finish. Also, this holster is fully adjustable: swappable carry clips, adjustable cant, and alternate between IWB and OWB. While it worked great IWB, it moved around a lot OWB. But I attribute that issue to the style of belt clips and to my body shape. The holster was rather large for my frame, so I can’t fault it for that. 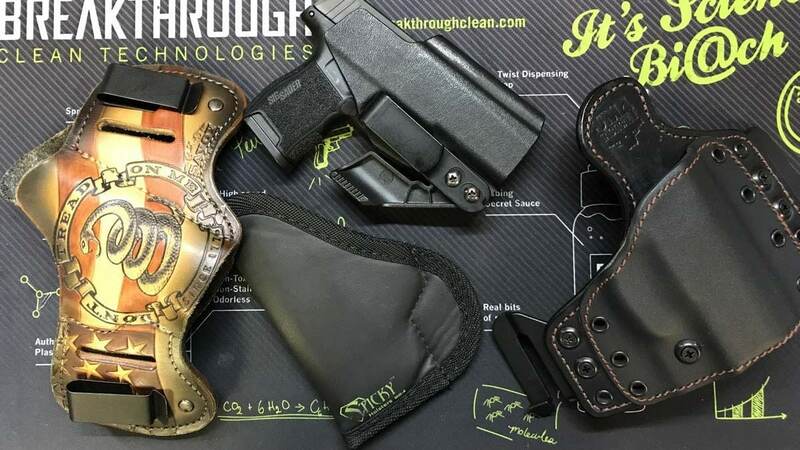 It was definitely the most versatile and for someone who is looking to get one holster to cover all situations, the JM4 Tactical RELIC does it better than most. For carrying the Sig P365, all five worked well. Ultimately, I’ll probably use the ANR and HazMat holsters the most, but that’s just me. Hopefully this will help if you’re looking for a great holster to carry your new Sig Sauer P365. Do you have other suggestions? Let us know in the comments section.